Baci chocolates are one of the most widely known and loved products from Piedmontese confectionery tradition. 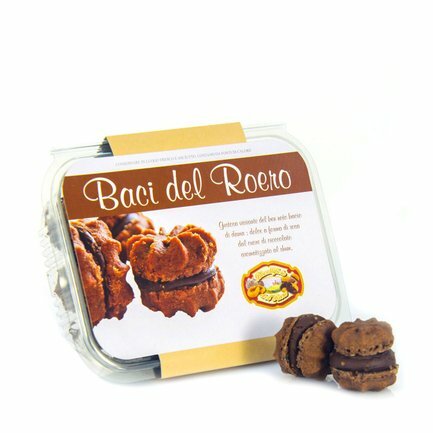 Biscottificio Roeri produces these chocolate baci or "kisses" using exclusively artisanal techniques, with two identical parts made of hazelnuts, sugar, flour and an exquisite layer of rum flavoured dark chocolate to join them. Savour them after dinner or for a tasty snack with your favourite coffee blend, a cup of hot chocolate with cream or unaccompanied, for a moment of sweetness that offers all the flavour of times gone by. Ingredients sugar, hazelnuts, egg white, glucose-fructose syrup, bitter cocoa, iodine salt, flavourings. Filling: dark chocolate (sugar, cocoa paste, cocoa butter, emulsifier: soya lecithin, vanilla extract), butter, hydroalcoholic solution. Allergens: other nuts, gl For more information on product labels, please contact our Customer Service department. The information on the labels of the products may vary for reasons beyond our control, therefore, there may be discrepancies between the information on the site and that on the products delivered. Please always check the information on the product before consumption or use.